This is one of Strelets' 'Big Sets', and it contains three previously-released sets plus a new collection of figures in the same manner as their earlier Medieval Britain Set. The three reissued sets in this product are Crimean Russian Terek Cossacks, Crimean Russian Grenadiers and Crimean Russian Naval Artillery. Since all these sets have already been reviewed we will not picture or comment on them here and would direct you to those reviews using the above links. Equally our scores relate only to the new figures which we have pictured on this page. Alexander Sergeyevich Menshikov (1787-1869) - He was commander-in-chief of all Russian land and sea forces but performed poorly and was replaced in February 1855. Alexander Mikhailovich Gorchakov (1795-1861) - There were several Gorchakovs in the Russian army, but this figure depicts Menshikov's replacement as commander-in-chief. Vladimir Alexseyevich Kornilov (1806-1854) - He was a vice-admiral and led the defence of Sevastopol with skill before being killed at the Malakoff redoubt. Pavel Nakhimov (1820-1855) - Another hero admiral of the siege of Sevastopol and the Russian Navy in general, who led the defence with great inspiration and courage until he was killed in June 1855. Vladimir Ivanovich Istomin (1809-1855) - This brave and energetic rear-admiral was in command of the Malakoff Mound until he was killed in March 1855. Lieutenant-Colonel Eduard Ivanovich Totleben (1818-1884) - Totleben was an outstanding engineer who created the formidable defences of Sevastopol from almost nothing and certainly deserves his acclamation as a hero of the siege. Happily he survived the war and was much honoured around the world in the following years. The pose is a rather clichéd one, with him holding dividers and a plan, so we are in no doubt that he is an engineer. Dasha Alexsandrovna - This lady devoted herself and what funds she could raise to caring for the wounded. In her own way at least as much a hero as the military men. Count Tolstoy (1828-1910) - Tolstoy commanded a battery in Sevastopol, but had an unremarkable service record during the war. His inclusion in this set is purely a result of his later fame as a writer. The remaining two poses in this row are of general staff officers. All the staff officers wear much the same uniform, being a frock coat with epaulettes appropriate to their rank but mostly without the frivolous accessories like the aiguillettes. They are either bare-headed or wear a normal peaked cap, and as such are accurately dressed as they would normally be seen during the war. The third row contains some religious figures. The average Russian soldier was very devout and great comfort was gained by blessings and the showing of icons and other religious symbols before battle. Here we find a bishop followed by a deacon holding the Gospels and a layman carrying one of the famous icons, plus a couple of acolytes (alterboys) carrying banners. A very important part of the life of a Russian soldier, so a worthwhile addition to this set. Row four holds the first of the hospital figures. It begins with two surgeons, the first being labelled as Nikolai Ivanovich Pirogov (1810-1881), a pioneering surgeon who made many important advances in Russian medicine as well as serving during the war. Sadly both these surgeon figures are utterly useless. They both wear caps, surgical masks, gowns and gloves, none of which were even dreamt of during the Crimean War. It was only in the late 19th century that science began to understand the value of cleanliness and hygiene thanks to the work of men such as Pasteur, Lister and Koch, and it was not until the 20th century that surgeons began wearing masks and other special clothing to perform their trade. Even in the most advanced operating theatres in London, Paris or St. Petersburg surgeons merely wore an apron, and that was only to protect their clothes from blood splashes. These figures are therefore many decades too early for the period. The third figure is a nun, and is labelled as a sister-in-charity of Krestovozdvishensky community. Nuns were commonly used as nurses, and the huge casualties suffered by the Russians during this war meant they were kept very busy. The stretcher party to her left is quite nice, with the stretcher and bearers fitting together very well (the casualty is not separate from the stretcher). Moving on we find a row with more casualties including one being evacuated on a musket, which was common practice. The table is intended to support the prone figure on the next row, and comes with separate legs. These are not a firm fit so need to be glued. Next to the last patient we find a Russian soldier or sailor carrying a bucket, followed by a little light relief as a Cossack dances to the tune played by his colleague. This is neither staff nor hospital, but adds a welcome touch of colour and humanity to the Russian figures. Finally we come to the six mounted figures and their mounts. 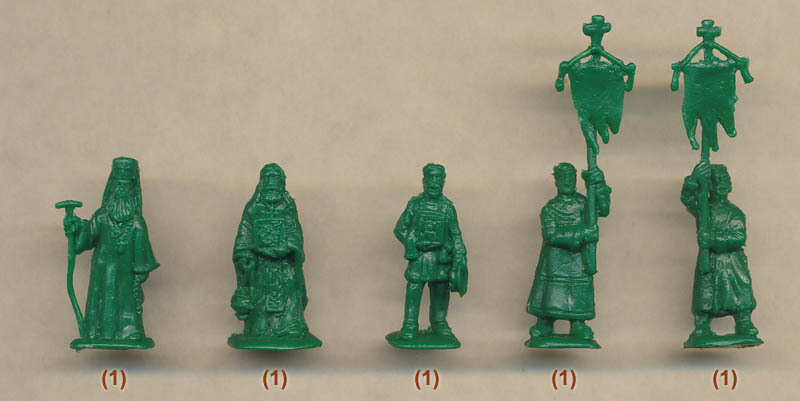 All the figures are officers or ADCs, and include one Cossack officer, one wearing the dress helmet and one with the old-fashioned bicorn. As with their colleagues on foot they are correctly dressed and all the poses are appropriate and well chosen. Sadly their horses, which are the same as those in the Cossack sets, are not so good. Some of the poses are not natural, but perhaps just as bad is that most seem to be galloping forward at considerable speed, which contrasts starkly with the much more realistic relaxed poses of the riders. While officers would have galloped on occasion, having horses either walking or standing still would have been a great deal better. However the riders do mostly fit their animals very well and tightly. The overall standard of sculpting is not great, with some rather vague or missing detail. Some of the faces, particularly that of the stretcher case, are really quite poor, although others are nice and expressive. The swords and particularly the scabbards of all the officers are especially short, and in general this set is of about average standard of sculpting from Strelets – not as good as some of their best work recently. However there is no flash and where parts need to be assembled they fit together well enough. The choice of figures is quite good but the two surgeons are a waste of plastic, which means the most obvious missing component in the set is - surgeons, or at least accurate ones! Still this sort of set is a good complement to the assorted infantry, cavalry and artillery sets for an army, and while this may not be a brilliant example it does adds interest to the Russian army of the period and we would hope to see more such sets in the future.